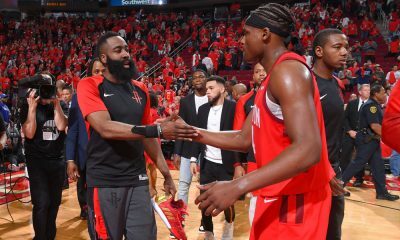 The loss to Portland was painful but also educational — the Rockets will have several key goals as they go into this offseason. I needed to take the weekend off before writing anything, but I think Rockets broadcaster Bill Worrell summed up this series best. “My heart is down on the floor right next to you. Please pick it up and massage it,” said Worrell to Clyde Drexler. And that was 30 seconds before Damian Lillard hit that shot. The final play of Game 6 was devastating, but it was a collective failure. While many have chosen to blame Chandler Parsons for not sticking with Lillard, that was only part of the problem. Initially, Kevin McHale rolled out Dwight Howard on the inbounder, placing James Harden on LaMarcus Aldridge and playing Jeremy Lin. When he realized the issues, he called a 20-second timeout to take out Lin, get Terrence Jones on the inbounder and put Dwight on Aldridge. Howard said that all the team talked about was stopping the three, but not only did the Rockets lose Portland’s best shooter, but take a look at Jones’ defense on the inbounder. He’s doing nothing but covering the pass down low to Aldridge, where Houston’s best defensive player is locked in. The Rockets left a Grand Canyon-sized hole at the top of the key with no resistance on the pass or the shooter. Did that look at all like a team trying to stop a three-pointer? But while the Rockets’ inability to stay with Lillard for less than a full second will haunt them this offseason, it’s only part of the nightmare. The fourth quarter collapse in Game 1. The absurd call against Dwight Howard in overtime of Game 1. The brain lapse in not calling timeout and then turning it over in Game 4. And now the infamous Game 6. The Rockets honestly blew three games in this series because of the little things. Correcting any one of these simple mistakes likely puts them in the second round of the playoffs against a team (San Antonio) that they swept in the regular season, and that’s what really should stick with them. The Rockets are top-heavy in talent, but it should be sobering to all of us that not only did the Rockets lose with home court advantage in this series, but Portland was likely the very best possible matchup out there. 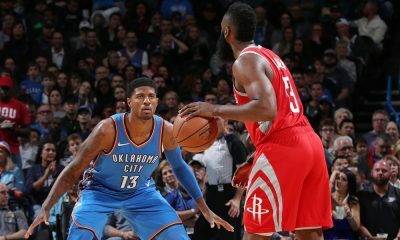 There are no easy outs in the West and the Rockets have not yet separated themselves, so this will be a very important offseason for this team. They can’t afford to just stay pat. Here’s what I think you can expect. There’s no doubt about it, Kevin McHale looked lost at times in this series. He didn’t make series-altering adjustments until Game 3. His team seemed unprepared in big moments. Ultimately, the Rockets underachieved and fell short of expectations. But while I thought it was premature to come out so early with a vote of confidence for McHale, there may be a method to the madness in keeping him for the final season (team option) of his contract. Remember, Dwight Howard was specific in saying that McHale was a big draw for him to sign with Houston. He is well-liked by his players and respected by many around the league. For example, he both drafted and coached Kevin Love, someone who could be traded between now and the summer of 2015, when he’s a free agent. 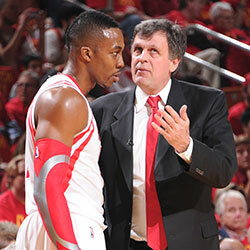 This next year gives McHale one more season to both lure talent and prove he is the right man for the job long-term. But the Rockets absolutely must hire an experienced, savvy, defensive-minded assistant, preferably one with head coaching experience. McHale can still serve as figurehead and team leader, but they could use X’s and O’s help on the defensive side after losing Kelvin Sampson. This is a must this offseason. The Rockets will not have near-max cap room until 2015, but I can promise you that they will operate this offseason as if they have it now. They will pursue Carmelo Anthony. They will watch to see if Chris Bosh opts out. Dirk Nowitzki will be a free agent, though it’s incredibly unlikely he would leave Dallas (much less for a rival city like Houston). They will pursue a trade for Kevin Love. Paul Millsap provides the best of both worlds — an upgrade at the power forward position and a player that expires in 2015. 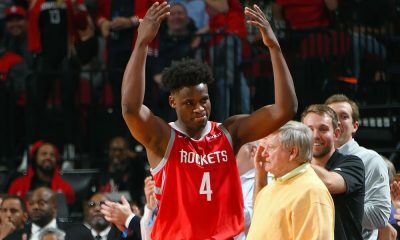 Rockets general manager Daryl Morey is on record as saying the Rockets lack a third-best player on a championship team. 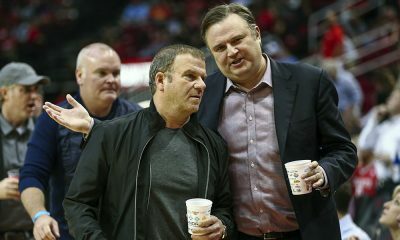 Until he acquires that player, the Rockets can not sign any role players to long-term deals beyond the league minimum salary because it will hurt their flexibility to acquire that key piece by 2015. With his hands tied under those restrictions, take a look at the team’s transactions this season: Omri Casspi, Francisco Garcia, Ronnie Brewer and Jordan Hamilton were all out of the rotation by the end of the season. They weren’t able to move Greg Smith for anything. It wasn’t until very late in the year that they were able to find a rotation player with a league minimum deal (Troy Daniels). They need to finalize their core so they can go over the cap and into luxury tax (if they so choose) to get the right pieces. Hands down, getting their third-best player is the top priority this offseason. 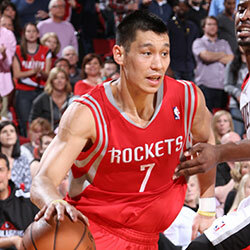 Here’s why I think we’ve seen Lin and Asik’s final games with the Rockets. The Rockets will be paying a hair under $30 million to a pair of backup players. I repeat — thirty mill. Backups. Even at a cap hit of $17 million, it’s a terrible allocation of cap space and funds. Asik is a luxury the Rockets can’t afford. Lin is a less-than-ideal fit on a team that would place more of a premium on sure-handedness, three-point shooting and defense at the position. He could do a lot more on a team with lower expectations that gave him carte blanche to operate and develop — much like the Rockets expected to be when they signed him. As mentioned before, Morey can’t sign anyone of significance until their foundation is set. Are they really going to use up another year of Dwight’s prime before making the move for the third guy? Getting a third guy means dealing Asik and/or Lin. It would have been irresponsible to trade Lin and Asik for nothing at this past February trade deadline given that they were in the middle of an important season. The Rockets were shopping those players looking for a big name star (unlikely) or for players that could help them this season without hurting their flexibility beyond 2015 (difficult). That concern does not exist this summer. They simply need to unload them off the books, knowing that the cap room itself is now a significant asset to work with. The Rockets will try to prepare several trade options they can turn to when the need for cap room arises. The Rockets can likely move Asik given that he is a rare commodity, but Lin for “nothing” (pure cap room) will cost the Rockets additional assets and will be harder to execute. I would be shocked if either player is still with the team by training camp in September. The three-point game is critical to the Rockets. They led the league in attempts per game (26.6), but were only mediocre in efficiency (35.8%, #16 in the league). In the playoffs, the Rockets shot 31.8% from three. Take out Troy Daniels? 29.5%. That’s an absurdly low rate given how much they depend on the three. Players who stretch the floor and can knock down a three-pointer when defenses double Dwight or collapse on Harden drives are essential. Defensive players, especially on the perimeter, are another must. The Rockets have one top defensive player (Patrick Beverley) that isn’t a center. Corey Brewer (COREY BREWER!) popped off for 51 on this team. They need a player or two with some length, athleticism and a defensive motor. So when it comes to role players, three-point shooting and defensive specialists should be high priorities this offseason. Last but not least, I want to talk about James Harden. The Rockets’ star guard was brilliant in Game 6, but it was five games too late in this series. The defense played by Wesley Matthews and Nic Batum played a role in slowing Harden, but there are far better defenders in the West, and that wasn’t the whole story. There were times he looked completely out of it and was unable or unwilling to attack the basket. His inability to stay focused on the defensive end has been a major problem since he’s been here. The team needs to get him some help, yes, but as the best player on the team, the Rockets will only go as far as Harden will lead them. It’s no secret that Harden is immature, as evidenced by his dustup with a reporter after Game 2. It’s a byproduct of being that young and that talented. 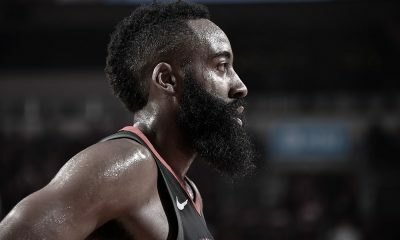 If anything good comes from this series, let it be that James Harden learns and grows from it, that he takes it personally and becomes a better professional next season. Les Alexander can’t buy this change. Daryl Morey can’t acquire it. Kevin McHale can’t coach it. It’s up to James.